My Facebook as of late has become rather non interactive. Aside from the short conversations I have on there with my family and friends I know in "real life", I feel really disconnected from all the other online interactions. 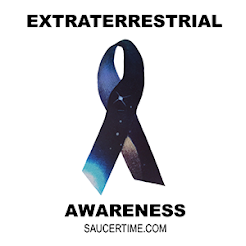 I follow a lot of professional companies and popular UFO source websites, but no one seems to be engaging in interesting conversations about the subject matter. It's mostly a lot of Likes, a comment here and there and some hate comments usually followed by a comment by someone that makes completely no sense that doesn't even pertain to the original post. So I strayed from Facebook and sought out online interaction else where. 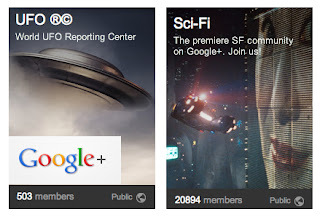 I clicked around my Google plus profile and found it has a lot to offer! I found two really great communities on Google Plus where the members stir up really interesting conversations and embrace other member's opinions and thoughts. Know of any other UFO communities that are note worthy? leave a link in the comments below.